My name is John Somsky. 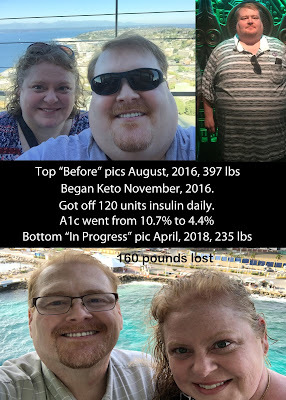 This is my story of reversing my Type 2 diabetes by following a ketogenic diet since November 1, 2016. I also helped to found the Minnesota Ketonians Keto Meetup group. I listen to a lot of podcasts. And by “a lot” I mean I subscribe to over 80 podcasts. This results in over 60 hours a week of content, which I listen to on double or triple speed. To my good fortune one of the podcasts I listen to is the ".NET Rocks" Podcast, a show which discusses software development using Microsoft’s .NET framework. Carl Franklin, one of the hosts of the show, mentioned on one of the shows that he was starting the "2 Keto Dudes" podcast to use motivation to keep following a ketogenic diet. I had heard of the ketogenic diet before, but thought maybe it was too extreme for me. But I liked listening Carl, so around May or June 2016 I started listening to the "2 Keto Dudes" podcast. It is hosted by Carl Franklin who had just starting keto as he started the podcast and Richard Morris who had been practicing keto for a few years. They explained that the ketogenic diet was a low carbohydrate, high fat, moderate protein diet which helps to reduce your bodies insulin response to food. In other words, eat less than 20 grams of carbohydrates, adequate protein (there is some debate over what “adequate” is, but I’ll save that discussion for later) and fat to satiety. Their excellent podcast explains the science behind keto and gives practical tips for following keto. All of this information and advice was invaluable. I was gathering all of the knowledge necessary to start keto myself. I wasn’t sure when I was going to start, but I was pretty sure I was going to try keto at some point. Then in October of 2016 I received a rude wake up call. I stepped on the scale and it read 397 pounds! I did not want to break the 400-pound barrier. Why was I gaining weight so quickly? Well it was all because of the insulin. Injecting insulin does help you reduce your blood sugar. This is because it now allows your body to store excess sugar in your fat cells instead of eventually going out in your urine. It reduces the damage caused by high glucose in your blood, but results in extra pounds easily being added. This made up my mind. I decided to start keto November 1, 2016. Because I was diabetic and keto can lower blood sugar, I started to measure my blood glucose 2-3 times each day. I wanted to make sure I wasn’t going to get any dangerously low readings. One of the temporary side effects people often have when starting keto is the “keto flu”. It can last a few weeks with symptoms like sugar cravings, dizziness, nausea, and a few more. I was lucky in that I didn’t experience much keto flu other than sugar cravings. Maybe it was because I had done Atkins in the past. Maybe I wasn’t following keto strictly enough, so I was easing myself into low carb. But for whatever reason it was I didn’t get “keto flu”. The first few pounds fell of fairly quickly, and I had lost 15 pounds by the beginning of December 2016. And I got my HbA1c was 7.7% which was higher than I would have liked, but I’d just started keto and I knew it would take some time to improve the damage it had taken years to create. In my next post I’ll discuss how I started to drop my insulin. You can also read my last post which discussed being diagnosed with diabetes. I'm an average guy looking to share how a ketogenic diet changed my life. KetoGrinder on Twitter and Instagram. I figure it's time for me to start sharing my story more openly and publicly. So I posted my keto story on the ketogenic forums and I'm posting it here as well. This is the beginning of a few changes to be a little more open. My name is John Somsky, I was born in 1968 and have struggled with my weight my entire life.I went on my first diet when I was in the second grade.I’ve tried nearly every diet imaginable and have literally lost hundreds of pounds on these diets over the course of my life.And with each diet I’ve eventually gained back everything I lost with a little extra for good measure. It's been too long since my last blog post, but life has gotten in the way as it has a tendency to do. But I have some interesting pieces of information to share, so its time to start blogging a little bit again. 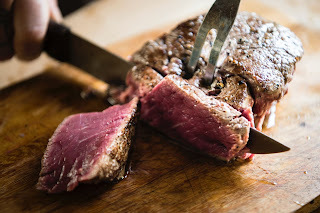 For this blog, I'm going to share the Steak Experiment I'm doing with Brenda Zorn of the IDM program and coordinated through Siobahn Huggins (working with Dave Feldman of the Cholesterol Code site). The test is to see how coffee interacts with a steak diet. The fist two weeks is just steak, water and a little salt. The second two weeks I get to add black coffee. The third two weeks I switch to decaf coffee. So only steak water and salt for food, no spices, no condiments nothing else. I was having success with the ketogenic diet and beginning to incorporate fasting into my routine. My wife was encouraged by my success and looking to find out more information. She is a pharmacist by trade and all of the information I was telling her went against her training as a diabetes educator. But she couldn’t argue with my success and she wanted to start experiencing the benefits of the ketogenic diet herself.